The purpose of this repository is to make prototypes as case study in the context of proof of concept(PoC) that I have written in my website: Accel Brain (Japanese). Especially, natural language processing, statistical machine learning, and deep reinforcement learning are main topics. The basic theme in my PoC is a Lifehack, which is any technique that reduces the burden of our life and make it easier to control, or more convenient. Considering that many lifehack solutions are technological and obviously product design and development technology are kind of life which can be hacked, lifehack itself also can be purpose of lifehack. Because of this Autologie, a seemingly endless round of my PoC and technological prototypes is rotary driven by Selbstreferenz to repeat lifehack of lifehack cyclically. In this problem setting and recursive solutions, this repository is functionally differentiated by compositions such as information collection, searching optimal solution, and focus booster. Each function can be considered an integral component of lifehack solutions. These tools make it possible to efficiency the process of contemplation and accelerate our brain, enabling provisions for the developments of other tools in this repository. All code, implemented as in an algorithm of machine learning or data science, reflects the concept of proof of concept(PoC). Especially, natural language processing, statistical machine learning, and deep reinforcement learning are main topics. pysummarization is Python3 library for the automatic summarization, document abstraction, and text filtering. The function of this library is automatic summarization using a kind of natural language processing. This library enable you to create a summary with the major points of the original document or web-scraped text that filtered by text clustering. Full documentation is available on https://code.accel-brain.com/Automatic-Summarization/ . This document contains information on functionally reusability, functional scalability and functional extensibility. The function of pydbm is building and modeling Restricted Boltzmann Machine(RBM) and Deep Boltzmann Machine(DBM). The models are functionally equivalent to stacked auto-encoder. The basic function is the same as dimensions reduction(or pre-training). And this library enables you to build many functional extensions from RBM and DBM such as Recurrent Temporal Restricted Boltzmann Machine(RTRBM), Recurrent Neural Network Restricted Boltzmann Machine(RNN-RBM), Long Short-Term Memory Recurrent Temporal Restricted Boltzmann Machine(LSTM-RTRBM), and Shape Boltzmann Machine(Shape-BM). As more usecases, RTRBM, RNN-RBM, and LSTM-RTRBM can learn dependency structures in temporal patterns such as music, natural sentences, and n-gram. RTRBM is a probabilistic time-series model which can be viewed as a temporal stack of RBMs, where each RBM has a contextual hidden state that is received from the previous RBM and is used to modulate its hidden units bias. The RTRBM can be understood as a sequence of conditional RBMs whose parameters are the output of a deterministic RNN, with the constraint that the hidden units must describe the conditional distributions. This constraint can be lifted by combining a full RNN with distinct hidden units. In terms of this possibility, RNN-RBM and LSTM-RTRBM are structurally expanded model from RTRBM that allows more freedom to describe the temporal dependencies involved. The usecases of Shape-BM are image segmentation, object detection, inpainting and graphics. Shape-BM is the model for the task of modeling binary shape images, in that samples from the model look realistic and it can generalize to generate samples that differ from training examples. The methodology of equivalent-functionalism enables us to introduce more functional equivalents and compare problem solutions structured with different algorithms and models in common problem setting. For example, in dimension reduction problem, the function of Encoder/Decoder schema is equivalent to DBM as a Stacked Auto-Encoder. Cho, K., Van Merriënboer, B., Gulcehre, C., Bahdanau, D., Bougares, F., Schwenk, H., & Bengio, Y. (2014). Learning phrase representations using RNN encoder-decoder for statistical machine translation. arXiv preprint arXiv:1406.1078., p2. According to the neural networks theory, and in relation to manifold hypothesis, it is well known that multilayer neural networks can learn features of observed data points and have the feature points in hidden layer. High-dimensional data can be converted to low-dimensional codes by training the model such as Stacked Auto-Encoder and Encoder/Decoder with a small central layer to reconstruct high-dimensional input vectors. This function of dimensionality reduction facilitates feature expressions to calculate similarity of each data point. This library provides Encoder/Decoder based on LSTM, which is a reconstruction model and makes it possible to extract series features embedded in deeper layers. The LSTM encoder learns a fixed length vector of time-series observed data points and the LSTM decoder uses this representation to reconstruct the time-series using the current hidden state and the value inferenced at the previous time-step. Shape-BM is a kind of problem solution in relation to problem settings such as image segmentation, object detection, inpainting and graphics. In this problem settings, Convolutional Auto-Encoder(Masci, J., et al., 2011) is a functionally equivalent of Shape-BM. 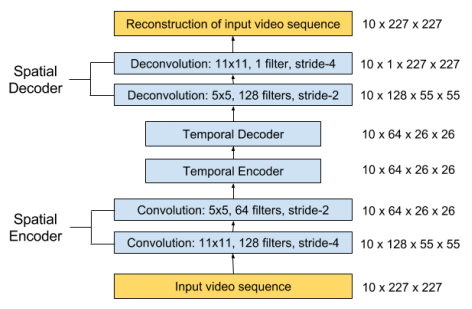 A stack of Convolutional Auto-Encoder forms a convolutional neural network(CNN), which are among the most successful models for supervised image classification. Each Convolutional Auto-Encoder is trained using conventional on-line gradient descent without additional regularization terms. My jupyter notebook: demo/demo_convolutional_auto_encoder.ipynb also demonstrates various reconstructed images. Encoder/Decoder based on LSTM and Convolutional Auto-Encoder have a functional reusability to extend the structures to Spatio-Temporal Auto-Encoder, which can learn the regular patterns in the training videos(Baccouche, M., et al., 2012, Patraucean, V., et al. 2015). This model consists of spatial Auto-Encoder and temporal Encoder/Decoder. The spatial Auto-Encoder is a Convolutional Auto-Encoder for learning spatial structures of each video frame. The temporal Encoder/Decoder is an Encoder/Decoder based on LSTM scheme for learning temporal patterns of the encoded spatial structures. 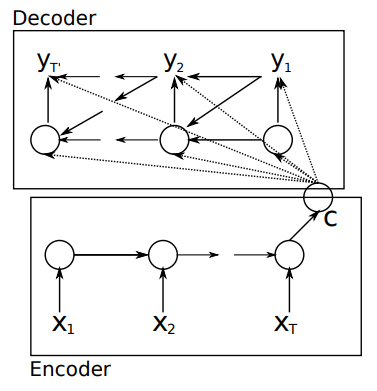 The spatial encoder and decoder have two convolutional and deconvolutional layers respectively, while the temporal encoder and decoder are to act as a twin LSTM models. Chong, Y. S., & Tay, Y. H. (2017, June). Abnormal event detection in videos using spatiotemporal autoencoder. In International Symposium on Neural Networks (pp. 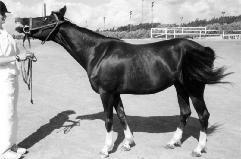 189-196). Springer, Cham., p.195. demo/demo_spatio_temporal_auto_encoder.ipynb is a jupyter notebook which demonstrates the video recognition and reconstruction of video images by the Spatio-Temporal Auto-Encoder. Full documentation is available on https://code.accel-brain.com/Deep-Learning-by-means-of-Design-Pattern/ . This document contains information on functionally reusability, functional scalability and functional extensibility. pyqlearning is Python library to implement Reinforcement Learning and Deep Reinforcement Learning, especially for Q-Learning, Deep Q-Network, and Multi-agent Deep Q-Network which can be optimized by Annealing models such as Simulated Annealing, Adaptive Simulated Annealing, and Quantum Monte Carlo Method. According to the Reinforcement Learning problem settings, Q-Learning is a kind of Temporal Difference learning(TD Learning) that can be considered as hybrid of Monte Carlo method and Dynamic Programming method. As Monte Carlo method, TD Learning algorithm can learn by experience without model of environment. And this learning algorithm is functional extension of bootstrap method as Dynamic Programming Method. In this library, Q-Learning can be distinguished into Epsilon Greedy Q-Leanring and Boltzmann Q-Learning. These algorithm is functionally equivalent but their structures should be conceptually distinguished. Considering many variable parts and functional extensions in the Q-learning paradigm from perspective of commonality/variability analysis in order to practice object-oriented design, this library provides abstract class that defines the skeleton of a Q-Learning algorithm in an operation, deferring some steps in concrete variant algorithms such as Epsilon Greedy Q-Leanring and Boltzmann Q-Learning to client subclasses. The abstract class in this library lets subclasses redefine certain steps of a Q-Learning algorithm without changing the algorithm’s structure. demo/search_maze_by_deep_q_network.ipynb is a Jupyter notebook which demonstrates a maze solving algorithm based on Deep Q-Network, rigidly coupled with Deep Convolutional Neural Networks(Deep CNNs). The function of the Deep Learning is generalisation and CNNs is-a function approximator. In this notebook, several functional equivalents such as CNN, Long Short-Term Memory(LSTM) networks, and the model which loosely coupled CNN and LSTM can be compared from a functional point of view. Deep Reinforcement Learning to solve the Maze. Black squares represent a wall. Light gray squares represent passages. A dark gray square represents a start point. A white squeare represents a goal point. Expanding the search problem of the maze makes it possible to describe the pursuit-evasion game that is a family of problems in mathematics and computer science in which one group attempts to track down members of another group in an environment. This problem can be re-described as the multi-agent control problem, which involves decomposing the global system state into an image like representation with information encoded in separate channels. This reformulation allows us to use convolutional neural networks to efficiently extract important features from the image-like state. demo/search_maze_by_deep_q_network.ipynb also prototypes Multi Agent Deep Q-Network to solve the pursuit-evasion game based on the image-like state representation of the multi-agent. Multi-agent Deep Reinforcement Learning to solve the pursuit-evasion game. The player is caught by enemies. Multi-agent Deep Reinforcement Learning to solve the pursuit-evasion game. The player reaches the goal. Moving dark gray squares represent enemies. There are many hyperparameters that we have to set before the actual searching and learning process begins. Each parameter should be decided in relation to Reinforcement Learning theory and it cause side effects in training model. This issue can be considered as Combinatorial optimization problem which is an optimization problem, where an optimal solution has to be identified from a finite set of solutions. In this problem setting, this library provides an Annealing Model such as Simulated Annealing to search optimal combination of hyperparameters. As exemplified in annealing_hand_written_digits.ipynb, there are many functional extensions and functional equivalents of Simulated Annealing. For instance, Adaptive Simulated Annealing, also known as the very fast simulated reannealing, is a very efficient version of simulated annealing. And Quantum Monte Carlo, which is generally known a stochastic method to solve the Schrödinger equation, is one of the earliest types of solution in order to simulate the Quantum Annealing in classical computer. Full documentation is available on https://code.accel-brain.com/Reinforcement-Learning/ . This document contains information on functionally reusability, functional scalability and functional extensibility. This library makes it possible to design the Generative models based on the Statistical machine learning problems in relation to Generative Adversarial Networks(GANs) and Adversarial Auto-Encoders(AAEs) to practice algorithm design for semi-supervised learning. This library provides the Adversarial Auto-Encoders(AAEs), which is a probabilistic Auto-Encoder that uses GANs to perform variational inference by matching the aggregated posterior of the feature points in hidden layer of the Auto-Encoder with an arbitrary prior distribution(Makhzani, A., et al., 2015). Matching the aggregated posterior to the prior ensures that generating from any part of prior space results in meaningful samples. As a result, the decoder of the Adversarial Auto-Encoder learns a deep generative model that maps the imposed prior to the data distribution. pycomposer is Python library for Algorithmic Composition or Automatic Composition by Reinforcement Learning such as Q-Learning and Recurrent Temporal Restricted Boltzmann Machine(RTRBM). Q-Learning and RTRBM in this library allows you to extract the melody information about a MIDI tracks and these models can learn and inference patterns of the melody. And This library has wrapper class for converting melody data inferenced by Q-Learning and RTRBM into MIDI file. Full documentation is available on https://code.accel-brain.com/Algorithmic-Composition/. This document contains information on functionally reusability, functional scalability and functional extensibility. This is the simple card box system that make you able to find and save your ideas. These modules are functionally equivalent to Python Scripts in AccelBrainBeat. This is a demo code for my case study in the context of my website. Accel Brain Code: From Proof of Concept to Prototype. RTRBM, RNN-RBM, and LSTM-RTRBM for probabilistic time-series model. Shape-BM for image segmentation, object detection, inpainting and graphics.